Take the next step in your life's journey. We are one of more than 240 NeighborWorks organizations working in over 4,000 urban, suburban, and rural communities nationwide. 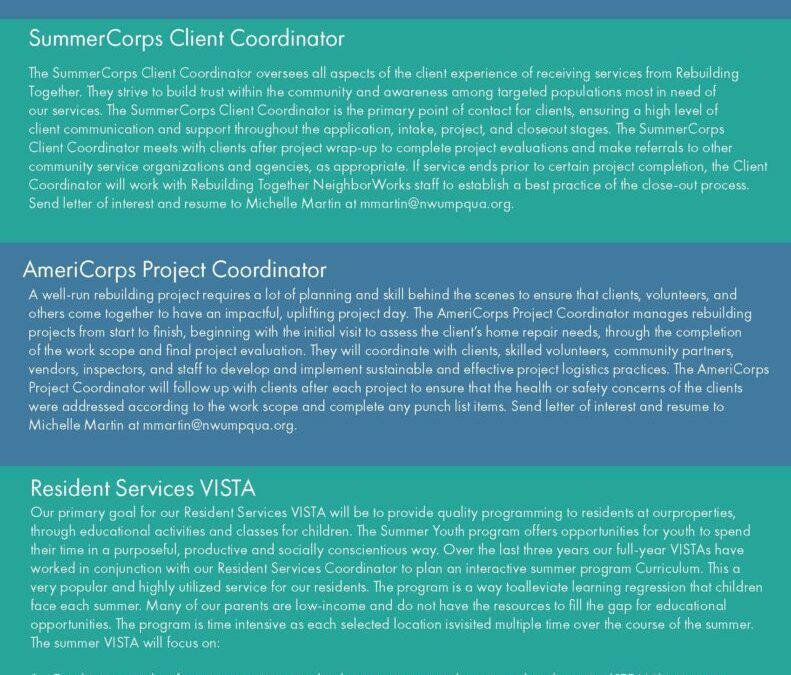 Our link to this powerful and unique nationwide network of community development organizations adds great value to our services in Southern Oregon. NeighborWorks Umpqua is a private, rural nonprofit organization working to enhance the lives of Oregon residents in Coos, Curry, Douglas, Josephine, Jackson, and Lane County with services in housing, finance, and community. We increase access to affordable housing and create partnerships that promote community stability, business success, and economic growth with a variety of services. The organization connects Southern Oregon residents with resources and services that drastically improves the lives and enhances the local communities. Begin your housing or finance education with a NeighborWorks Umpqua class or workshop. Tax Preparation Service is Ready for Appointments, Make Sure to Reserve your Spot! NeighborWorks Umpqua excited to reopen Volunteer Income Tax Assistance Sites. January/February Edition of The Works is here! Are you here for more information about Deer Creek Village? We are excited to bring a new multifamily development to the Douglas County area. It is still extremely early in the paperwork process, and while we appreciate the excitement from our community, we are unable to take applications or solicit for applications while we are so far out from construction beginning, tentatively set for mid-to-late 2019. Once we are close to finishing construction, we will advertise and ensure our community knows we are ready. Thank you for your patience! We are unable to take any applications at this time. Have a question? Fill out the form below and hit submit.